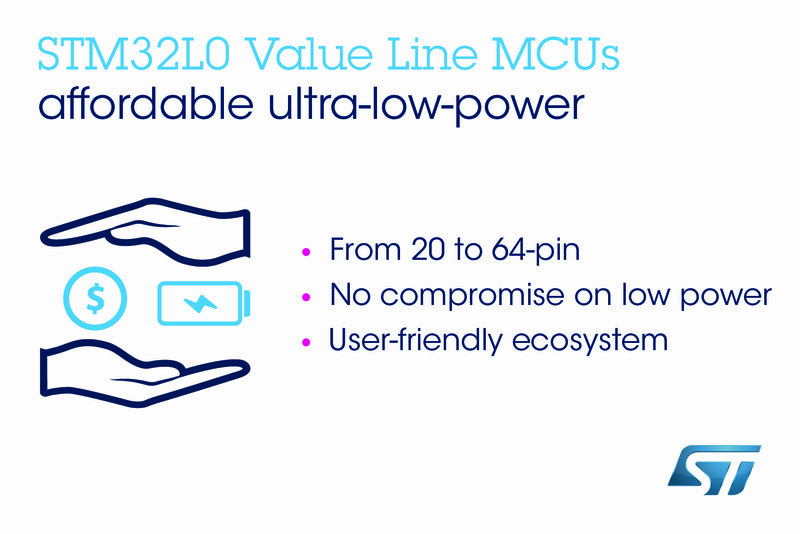 Geneva, November 8, 2018 -- New STM32L0x0 Value Line microcontrollers (MCUs) from STMicroelectronics present an additional, low-cost entry point to the STM32L0* series, delivering ultra-low-power technology and efficient 32-bit performance with the Arm® Cortex®-M0+ core for designers facing tight cost, size, or power constraints. With up to 128Kbyte Flash memory, 20KByte SRAM, and 512Byte true embedded EEPROM on-chip the STM32L0x0 MCUs save external components to cut down on board space and BOM cost. In addition to price-sensitive and space-constrained consumer devices such as fitness trackers, computer or gaming accessories, and remotes, the new STM32L0x0 Value Line MCUs are ideal for personal medical devices, industrial sensors, and IoT devices such as building controls, weather stations, smart locks, smoke detectors, or fire alarms. ST’s power-saving low-leakage process technology and device features such as a low-power UART, low-power timer, 41µA 10ksample/s ADC, and wake-up from power saving in as little as 5µs, bring ambitious energy-management targets within reach. Designers can use these devices to achieve goals such as extending battery runtime without sacrificing product features, increasing wireless mobility, or endowing devices like smart meters or IoT sensors with up to 10-year battery-life leveraging the ultra-frugal 670nA power-down current with RTC and RAM retention. Complementing the affordability of the new Value Line devices, the development ecosystem allows low-cost design starts. The Keil MDK-ARM professional IDE supports STM32L0x0 devices free of charge, and the STM32CubeMX  [/u] configuration-code generator provides easy-to-use design analysis including a power-consumption calculator. A compatible Nucleo-64 development board (NUCLEO-L010RB) with Hardware Abstraction Layer (HAL) library is already available, to facilitate fast project startup. The STM32L0x0 Value Line comprises six new parts, giving a choice of 16-Kbyte, 64-Kbyte, or 128-Kbyte of Flash memory, 128-Byte, 256-Byte or 512-Byte EEPROM, and various package options. In addition, pin-compatibility with the full STM32 family of more than 800 part numbers offering a wide variety of core performance and integrated features, allows design flexibility and future scalability, with the freedom to leverage existing investment in code, documentation, and tools. STM32L0x0 Value Line microcontrollers are in production now, priced from $0.44 with 16-Kbytes of Flash memory and 128-Byte EEPROM, for orders of 10,000 pieces. The unit price starting at $0.32 is available for high-volume orders. Please visit www.st.com/stm32l0vl for further information.